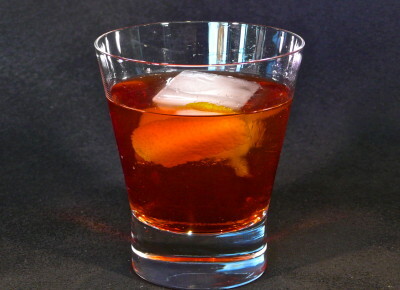 Stir the rye whiskey, bourbon, sweet vermouth, tawny port, white crème de cacao and campari with ice in a mixing glass. Strain over an ice cube into an Old-Fashioned Glass. A great drink from the gang at Death & Co. in New York City. Like a Manhattan, yet getting it’s bitter component from the campari; caramel & raisin notes from the tawny port; and chocolate from the cream de cacao. 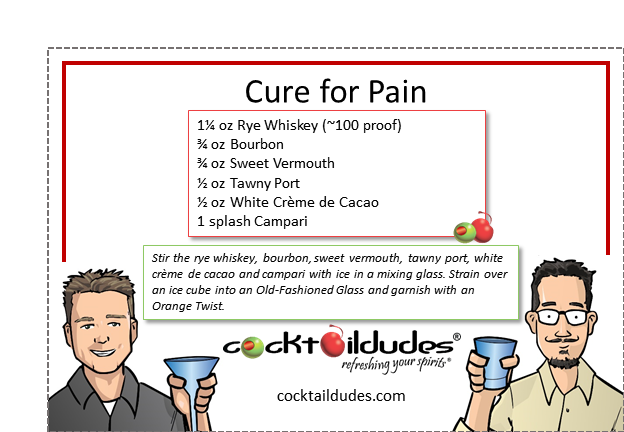 Of course, with it originating from Death & Co. it would be called Cure for Pain. It does come out “hot” but let it sit for a minute in the ice and whatever the pain, it’s guaranteed to be cured.